Betterprint provide brochure printing for businesses throughout Australia. Our custom brochure printing service, is one that produces an outstanding product as well as a super fast turnaround and delivery time. We provide brochure and catalog printing for businesses in Sydney, Melbourne, Perth and beyond. Simply get in contact with our team of highly skilled and experienced designers and we will happily discuss our service and, if you like, set you up with printed brochures at an outstanding price. 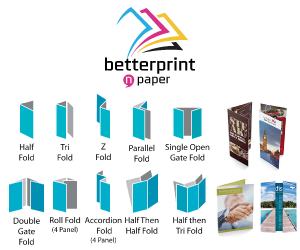 Why Select Betterprint for Your Brochure Printing? It’s not just the eye catching style and amazing price on our brochure printing service that makes Betterprint Australia’s first choice in printing. We provide our valued clients with a number of awesome services which will give you peace of mind throughout the printing and delivery process. We believe that providing an outstanding brochure and catalog printing service goes beyond the print itself, and therefore we’re always here to discuss your requirements as a business. If you would like to enlist the services of Australia’s top choice for stunning, highly efficient brochure printing services, or would like to discuss having a product made for your business, feel free to get in contact with the friendly and helpful team at Betterprint. You can contact us via our contact page or give us a call on (03) 9786 3500 and we will be happy to have a chat about your design requirements.